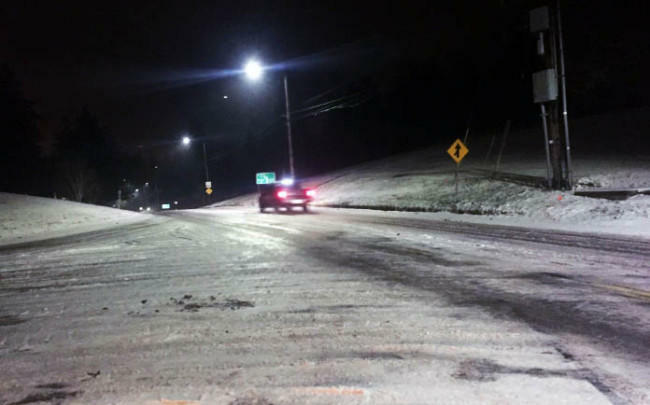 PORTLAND, Ore. -- A winter storm brought more ice and less snow to the Portland metro area as the sun went down Thursday evening, CBS affiliate KOIN reports. Thousands of people across the region were without power as the snow turned to freezing rain. By 6:30 p.m., around 5,800 PGE customers lost power in Marion County, more than 500 in Clackamas County, about 940 in Multnomah County and close to 300 in Washington County. Snow will be spreading from south to north with approximate updated arrival times of the snow band moving up I-5, CBS affiliate KIRO reports. The Portland metro area got just under 1 inch of snow during Thursday’s event. The snow turned into freezing rain in the afternoon hours, and roads have been extremely slick ever since. Snow continues to fall in the Gorge, which is projected to get 3-5″ by the end of the day. Hood River is getting hit the hardest, and snow totals there could be much higher. A Winter Storm Warning will remain in effect for the Gorge through Friday afternoon because it is the last place the cold air will move out of. Portland will see more freezing rain throughout Thursday night. The freezing rain has ended in the Willamette Valley, but showers are expected to continue. Most local school districts were closed for Thursday’s storm, and many — including those in the Gorge — are preparing for another day off on Friday.